Fall is in full force here with winter soon to follow and we wanted to give you an update of what we are working on in this season of bounty and giving. We had a very successful Faithify crowdfunder this summer and we so appreciate your help. As a result of your donations and support, many new and innovative things will be happening to eliminate childhood hunger in a variety of ways. We are currently developing several free lesson plans on childhood hunger themes to include on the website. These lessons will be customizable for a variety of uses and ages. We are so excited to add these tools to our offerings. NCGH has worked with two congregations to create and fill Community Food boxes. Based on the Little Free Library concept, an attractive food box is built curbside for people to easily either take what portable food they need or to donate food to the initiative. 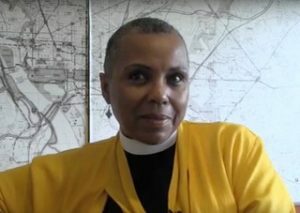 Pictures below are from the River Road UU Congregation in Bethesda, Maryland and the UU Congregation in Columbia, MD. Maybe this concept is something that could work for you to help your community? Visit www.littlefreelibrary.org for ideas and plans on how to build one of these. 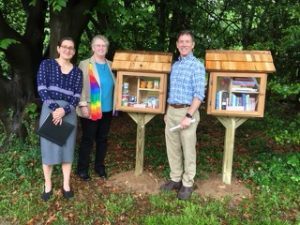 Our friends at the Unitarian Universalist Congregation of Columbia with their Community Box. 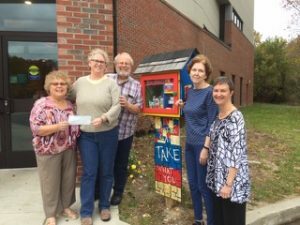 River Road Unitarian Universalist Congregation supports a Community Box and a Little Free Library. During this season of bounty, we hope you’ll remember No Child Goes Hungry in your end-of-year donations! We provide so many meals to those in need and help communities learn how to eliminate childhood hunger one meal- one kid at a time. One way to do this is to participate in #GivingTuesday on November 27th! Visit our donation page to make a one-time or reoccurring tax deductible gift. Thank you for your support and Let’s Go Feed Some Kids!